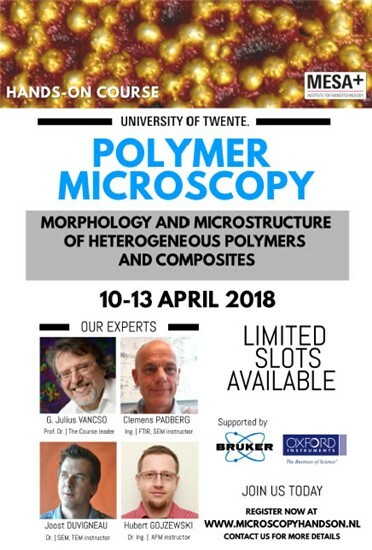 In April, 10-13, 2018, the group of Materials Science and Technology of Polymers at the University of Twente, led by Prof. Dr. G. Julius Vancso, has been organizing the Polymer Microscopy Hands-On Course, with limited to moderate experience in polymer microscopy. The morphology and microstructure of heterogeneous polymers and composites were in the focus of our interest. The course is aimed at researchers, engineers and technicians, both in industry and academia, with limited to moderate experience in polymer microscopy. We would like to share our passion for polymers by offering you up to 17 hours of pure hands-on laboratory sessions. These sessions will cover the fundamentals of scanning electron (SEM), transmission electron (TEM), atomic force (AFM), optical (OM) and infrared (FTIR) microscopy. In addition, distinguished speakers and experts will give informative lectures. The course includes sample preparation (microtoming, etching, cryo-fracturing), surface analysis, data interpretation, environmental control, artefacts and pitfalls in polymer microscopy. There will also be an opportunity to study your own samples, where we will be happy to share our knowledge and expertise with you. The course fee is 2850 EUR (netto). This includes tuition, course handouts, group training on instruments (2-3 participants per instrument), lunch and coffee breaks. 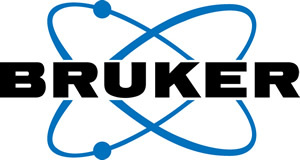 The course fee does not include accommodation; however rooms will be available at Conference Hotel Drienerburght on the campus of the University of Twente (www.drienerburght.nl). Please mention “Polymer Microscopy” when booking a room. Reservation is required before 28 February 2018. After registration we will send you a personal invoice with payment instructions. Cancellations received up to 14 days before the first day of the course will be fully refunded. Cancellations received after this date will not be refunded. Substitutions may be made at any time. Should the course be cancelled for any reason, the liability of the organizers is limited to the reimbursement of the course fee. Enrolment is restricted. For questions about the Hands-on Course, please enter your questions/remarks in the contact page. Your comments and questions are welcome!